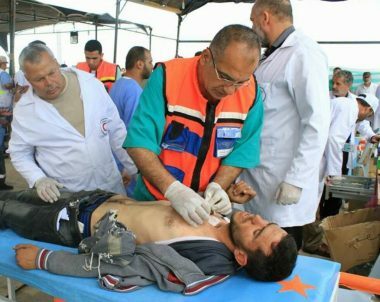 The Palestinian Health Ministry has confirmed, Monday, that Israeli soldiers killed (by approximately 3 in the afternoon) 25 Palestinians, including one child, and injured at least 918, in several parts of the Gaza Strip. 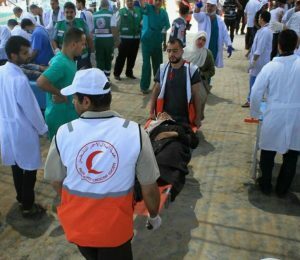 It said that 584 of the wounded Palestinians were rushed to hospitals in several parts of the Gaza Strip, and added that 74 of them were children, and 23 women. The Ministry stated that 39 of the wounded Palestinians suffered serious wounds, eleven suffered very critical wounds, 441 suffered moderate injuries and 427 suffered mild wounds. 448 Palestinians were shot with live fire, three with rubber-coated steel bullets, 65 suffered injuries from shrapnel, 83 suffered cuts and bruises and 320 suffered the effects of teargas inhalation. 32 of the wounded were shot in the neck and head. 49 in the upper limbs. 19 in the chest and back. 18 in the abdomen and pelvis. 413 in the lower limbs. 67 suffered injuries to several parts of their bodies. 413 suffered the effects of teargas inhalation. One Palestinian medic, and eight journalists, are among the wounded, while army fire also caused damage to at least one ambulance. Mohammad Ashraf Abu Sitta, 26. Bilal Ahmad Abu Doqqa, 26. Fadi Hasan Abu Salma, 30. Mo’tasem Fawzi Abu Louli, 20. Fadi Hasan Abu Silmi, 30. Ahmad Adel Mousa Sha’er, 16. The Palestinian Health Ministry has reported that Israeli soldiers killed, since Monday morning, sixteen Palestinians with live fire, including two children, and injured at least 918, in several parts of the coastal region. 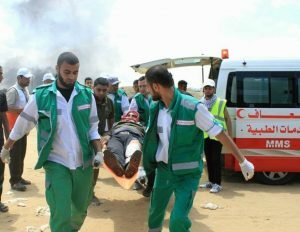 Dr. Ashraf al-Qedra, spokesperson of the Health Ministry in Gaza said the soldiers injured 918 Palestinians, including at least 165 with live fire, near border areas in northern Gaza Strip, Gaza city, the Central District, Khan Younis and Rafah in the southern parts of the coastal region. Bilal Ahmad Abi Doqqa, 26. In addition, the Palestinian Journalists’ Syndicate has reported that six of the wounded are journalists, including Algerian TV cameraman, Omar Hamdan, who was shot near the eastern border of Gaza. It is worth mentioning that, at the time of this report, the Health Ministry said the number of slain Palestinians has arrived to sixteen, but their names have not been made public yet.